Love to put lemon in your water, but hate the mess? Don’t like the stories about dirty lemons in restaurants? Maybe you are like me and just can’t seem to get down 8 glasses of plain water a day. Regardless of your reason, I suggest you give True Lemon a shot. 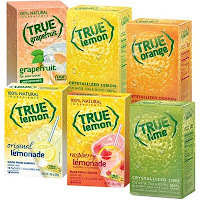 True Lemon is 100% natural with no artificial ingredients or sweeteners, preservatives, sodium, or gluten. It is available in lemon, lime, orange, grapefruit, lemonade, and raspberry lemonade. My favorites are lemon and grapefruit, but you can taste all of them with the True Sampler .